This recipe for cheese babka or babka serowa (BAHB-kah seh-RROH-vah) uses the same sweet yeast-raised dough of a traditional babka with the addition of a subtle sweet cheese filling that sinks to the bottom, which becomes the top! If you can't find dry curd cheese, you might want to make your own farmer's cheese from scratch. Three risings make this cheese babka, which is baked in a babka or fluted Bundt pan, a very light cake. The dough should be slack and pourable after rising. 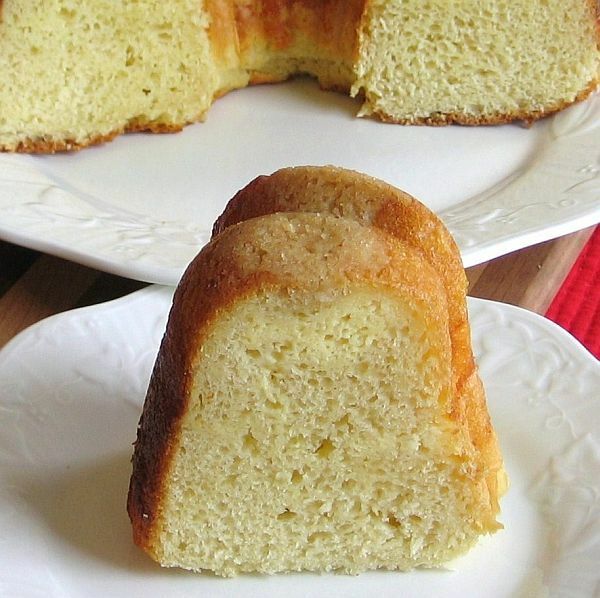 Babka recipes also exist with doughs that can be rolled and baked in loaf pans. In medium bowl, cream together 4 ounces butter and 1/2 cup sugar. In a large bowl or stand mixer with the paddle attachment, beat salt and eggs until thick and pale yellow. Beat in the butter-sugar mixture. It may look curdled, but that is okay. In a small bowl, dissolve yeast in warm water. Add to butter-sugar-egg mixture along with lemon zest and cinnamon (if using). Beat in flour alternately with milk until smooth and dough starts to blister, about 7 minutes. The dough will be very slack. Scrape down the sides and let rise, covered, in the same bowl until doubled. Stir down dough, cover and let rise again until doubled. Meanwhile, make the filling by beating on high speed until light and slightly thickened (about 10 minutes) the cheese, egg yolks, 6 tablespoons sugar, 1/2 teaspoon salt, lemon extract (if using) and vanilla. Refrigerate until ready to use. To make the topping, in a small bowl, combine flour and sugar and cut in butter as for pie dough. Set aside. Place rack in middle of oven and heat to 350 F. Coat a 12-cup babka or Bundt pan with cooking spray. When dough has risen for the second time, pour into the prepared pan. Pour cheese filling on top, followed by crumb topping. The cheese and crumbs will sink to the bottom, which becomes the top once unmolded. Bake about 35 to 60 minutes testing with a toothpick for doneness. Start checking cake after 35 minutes because the light dough bakes fast. Remove from oven and cool in pan on a wire rack 15 minutes. Invert onto a wire rack, remove pan and cool completely before serving. The babka can be dusted with confectioners' sugar if desired.